Sans commentaire, another letter (dated 1 July 2008) by Tony Towle concerning Andrew Epstein’s attributing of a poem “about” LeRoi Jones to Frank O’Hara. Earlier pieces of the exchange found here and here. First I would like to state for the record that I have not for one minute equated Andrew Epstein’s representing “Finding Leroi a Lawyer” as a poem by Frank O’Hara with the Kent Johnson hoax regarding the authorship of “A True Account of Talking to the Sun at Fire Island.” Epstein’s is clearly an honest opinion, and now that I have read the details of how he ran across the poem (in one of the “Frank O’Hara” folders in the Kenneth Koch archives in the Berg Collection of the New York Public Library), I can understand why he had no doubts—the circumstances of its discovery made it seem genuine beyond question. Mr. Epstein answers my caveats about the use of Patsy Goldberg’s full name by giving many examples of Frank’s using either the first only or first and last names of his friends in poems, and of course he’s right; but in his examples (and everywhere else in Frank’s oeuvre) these choices have an inevitability (often having to do with the music of particular lines) that is absent here. The full “Patsy Goldberg”* rings false in this poem, as does the full “Leroi [sic] Jones” in the body of the work when only the first name appears in the title. The writer seems more concerned with clearly identifying selected individuals than I feel Frank would have been. The mention in the poem (and, according to the title, it is what the poem was “about”) of LeRoi Jones’s trouble with the post office over his magazine, The Floating Bear, placed it between 1961 and 1963. Mr. Epstein has pinpointed this event to October 1961, when Jones was arrested and threatened with prosecution (along with Diane Di Prima, the co-editor) for sending obscene material through the mail, and thinks that this increases the likelihood of O’Hara being the author (or at least of Kenneth Koch not being). As Epstein notes, Jones’s brush with postal—government—censorship was indeed a very big deal in the downtown art and poetry world at the time and Frank took it as seriously as anyone except perhaps the two principals themselves. So let’s examine the pertinent lines and see what kind of solidarity O’Hara is offering his beleaguered friend. The poem opens with the writer out on the street buying miscellaneous items for friends while the doings of other friends (such as Jane Freilicher) pop into his head. A propos of these self-imposed tasks, it strikes me as odd that he would be buying cigarettes for Joel Oppenheimer (Gauloises Bleues could be found in many stores all around the city), whom he did not see on as regular a basis as the other people mentioned in these first lines—when “suddenly” the writer “sees” a notice for a concert for the avant-garde Polish-American composer Lucia Dlugoszewski, then, as now, not a household name, so where he would have seen it outdoors is a puzzle, but definitely not on the front page of The New York Post, but anyway he sees it, which prompts him to run into a phone booth. At first it seems he has entered it to make a gratuitous witticism about an avant-garde Russian composer (Vladimir Ussachevsky) not being in the booth too; and it doesn’t seem to be until the mouthpiece falls off the receiver and he makes the connection between “mouthpiece” and “lawyer” that he thinks of his friend LeRoi and the trouble he is in—it is not really clear that that’s who he was going to call when he picked up the receiver (remember, he wouldn’t have been in the booth in the first place had it not been for the Dlugoszewski announcement, however it was “announced”)—and finally he makes a call to Jones but there is no answer. He then muses on his friend’s predicament for several lines, makes another wan joke, and then trails off in digression until he realizes he has lost his “shopping list.” The idea of Frank making actual shopping lists out of the blue (not connected with presenting a surprise gift at a house visit or party or rendezvous), and then running around the city to fill them, is ludicrous (but somebody else might parody O’Hara’s gift-giving in his poems by saying this). The salient point is, would LeRoi Jones have found his very unfunny situation thrown into the middle of this second-rate and rather facetious work supportive—or even amusing? The insensitivity is obliquely compounded by the fact that the well-known model for the poem was an elegy for a black woman. This may seem farfetched, but would probably not have been lost on Mr. Jones, or Mr. O’Hara either. 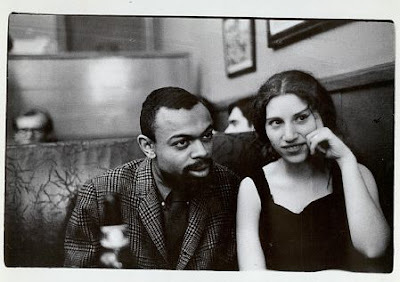 It was only three years later when Jones rejected the white world and became Amiri Baraka. Now of course Frank made jump-cuts in his work, and tossed in items and people from left field. However, this is the kind of poem in which O’Hara made brilliant and poignant poetry out of ordinary activities and events—but the activities and events came first. In this poem the quotidian aspect of the narrative seems fabricated and unconvincing. His classic “I do this I do that” creations are seamless; this one is anything but. Frank did edit a little (as Epstein notes and thinks he did here) but, because his original touch was so assured, that’s all the poem would need. This one needed a lot. 1) Is the name misspelled “Leroi” in the poem or the correct “LeRoi”? (Epstein: “it’s definitely possible that I transcribed it wrong and that the actual typescript says ‘LeRoi.’”) This should not be left in doubt, because although it is an error almost anybody else would make (I have made it myself) it would have been most unlikely for Frank to have done so. And in fact the writer of the poem makes it twice: once in the title and again in the middle of the poem. 2) Mr. Epstein says there is “one pencil correction”; he didn’t recall what it was, but thinks it was “probably” in O’Hara’s hand (that it would have stuck out if it were not). Well, is it in Frank’s hand or someone else’s? 3) Mr. Epstein has “no idea” whose typewriter was used but it “looked no different than any other typed poem by O’Hara.” It should be established that it was or was not Frank’s typewriter. Certainly there was no sinister or obfuscating motive behind Epstein not nailing these points down—he didn’t think he needed to; he was convinced. But to convince myself (and others) I think I might have to bestir myself and go take a look at this poem in person. If 2) and 3) check out, then I guess 1) was probably a typo (two typos). Until I can see for myself, I’m officially suspending judgment (and argument). I don’t know when I will actually make this trip to the Library but, when I do, I will let you know what I find. P.S. I am grateful to Mr. Epstein for providing a glimpse of the treasures that exist in the Kenneth Koch archive. I hope to look through some of them when I go there. * It’s interesting that the examples (provided by Mr. Epstein) of Frank using Patsy’s full name are all Patsy Southgate, her maiden name—which I believe she preferred people to use even before she and Mike were divorced—but in this poem the writer uses her full married name, which is another little incongruity. One of the sheets of Stones, the lithographic portfolio O’Hara did in collaboration with Larry Rivers (released in 1959) is titled “To the Health of Mike and Patsy Goldberg” (1958)—but this was apparently to celebrate their recent marriage. Did Frank ever use “Patsy Goldberg” in a poem other than (perhaps) this one? Electrical outages through the night and continuing. We enter the long weekend off the grid, in Mad Max “hoarding things in jerry-cans” mode, though hoarding what is the question. Hoard-worthy: independence.